Coppa for sale. Buy online at Zingerman's Mail Order. Gourmet Gifts. Food Gifts. You'd usually find coppa in central Italy, where it’s considered one of the kings of cured meat. Since the FDA prohibits us from importing cured meats like this, we offer you the next best thing: coppa from La Quercia. Actually, it might be a bit better than the first thing. I think we need to bring some of this version to Italy to find out—what do you think? 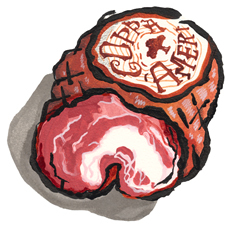 Coppa is made from lean shoulder meat that’s generously marbled with delicate, sweet fat. While it’s cured similarly to lomo, with smoked paprika and cocoa, it has more fat, so the flavor is more intense, the mouthfeel more luxurious. Slice a bit for an antipasto plate. Chop slices thickly for a salad. Or slip a bit into a boring old sandwich to make it fly. Like all their meats, La Quercia’s coppa is made from hogs raised naturally, without hormones or sub-therapeutic antibiotics. While the texture is the same as the Coppa above, its flavor is in a class all its own. Rubbed with fennel and paprika, it tastes smoky and spicy with somewhat of a sweet herbaceous character. Spicy in the good way (not blazing hot).